LinkItTM Smart 7688 Duo(a compact controller board) is an open development board based on MT7688(datasheet) and ATmega32u4. The board is compatible with Arduino Yun sketches and is based on the OpenWrt Linux distribution. The board is designed especially to enable prototyping of Rich Application IoT devices for smart home or office. 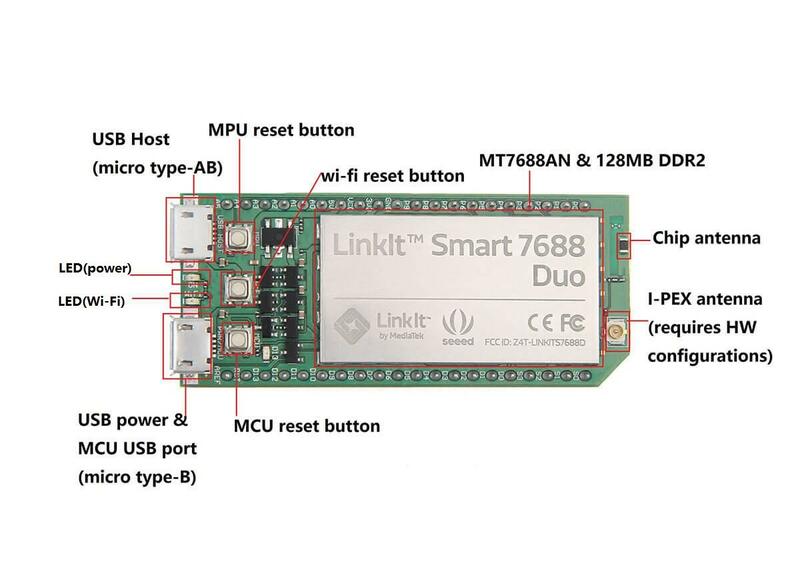 As it is compatible well with Arduino, you can use different features from Arduino Yun and LinkIt Smart 7688 Duo. This will help you build rich applications based on various, robust and compiled Arduino Yun sketches. The board offers you the memory and packet storage to enable robust video processing. The platform also offers options to create device applications in Python, Node.js and C programming languages. 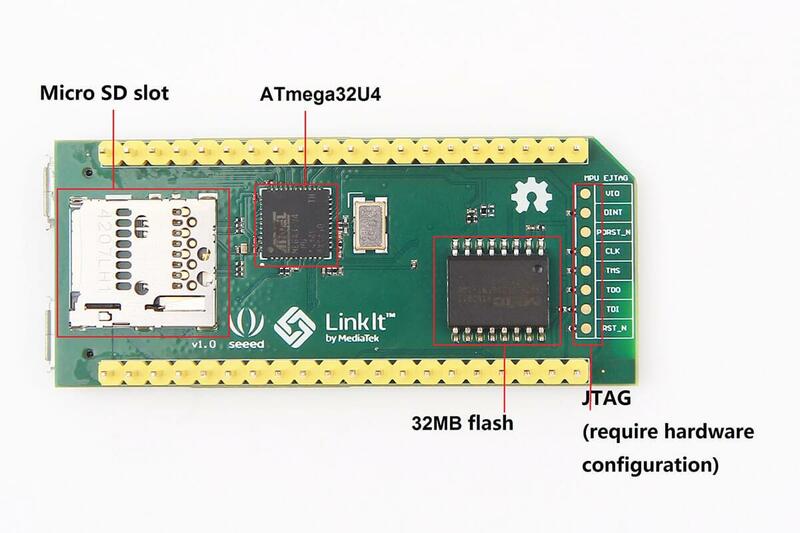 This page only guides you to get started with this development board. For a complete guide, please refer to Resources. Overshoot voltage of power input should not over 5.5. Voltage wave should be within ±100mV of rated voltage. There are two ways described in the manual. In this case, we only show an advanced method (using USB to Serial adapter) which might seem a little harder. But, you will benefit a lot from it in the long run. **1. **Install PuTTy. PuTTY provides a system console environment using SSH (Secure Socket Shell) to access development board's operating system. **2. **Install Bonjour Print Service (For Windows 7, Windows 8, Windows 10). **3. 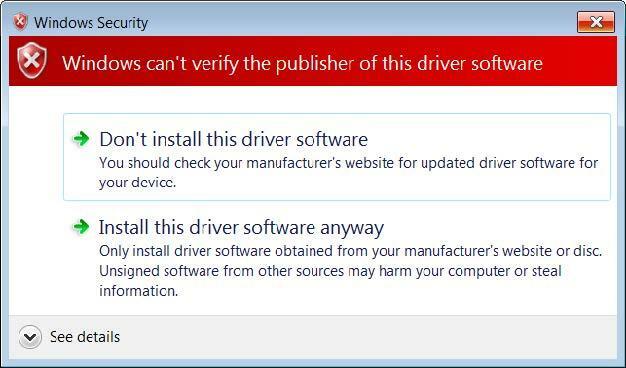 **Install driver. If you are using a USB cable based on FTDI chip please download and install its driver from here. If you are having problems with the latest driver, try installing an older version. **5. **After connecting the Serial to USB cable, open the device manager and notice the COM port number as shown in Figure 22. This number may vary on different computers. **6. 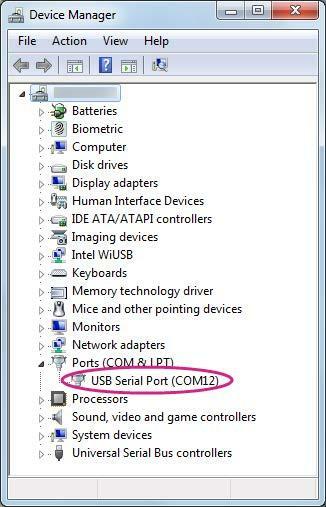 **Launch the PuTTY terminal and enter the COM port number of the USB device found in the device manager, click on the Serial radio button, type 57600 in Speed box and click Open, as shown in Figure 23. 7. **To exit the system console, click the **close icon on top right of the PuTTY windows. **1. **Install the driver if needed. Check the cable manufacturer's website for driver requirements on Mac and installation instructions. **2. 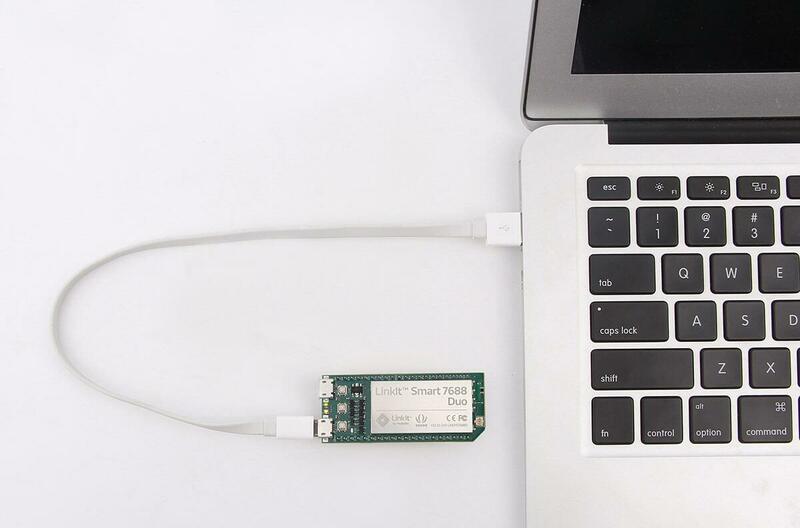 **Plug-in the cable to PC/Laptop and connect the cable to LinkIt Smart 7688. 4. **Type **ls /dev/cu* in the Terminal. You should see a list of devices. Look for something like cu.usbserial-XXXXXXXX where XXXXXXXX is usually a random identifier. This is the serial device used to access the system console. **7. **You are ready to make changes to the LinkIt Smart 7688 system through this console. **1. **Install the driver if needed. Check the cable manufacturer's website for driver requirements on Linux and installation instructions. **2. **Plug-in the cable and connect the cable to LinkIt Smart 7688 Duo. **1. **Power up your board with a micro-USB cable (only connect the USB Power interface, rather than the USB Host interface). **2. 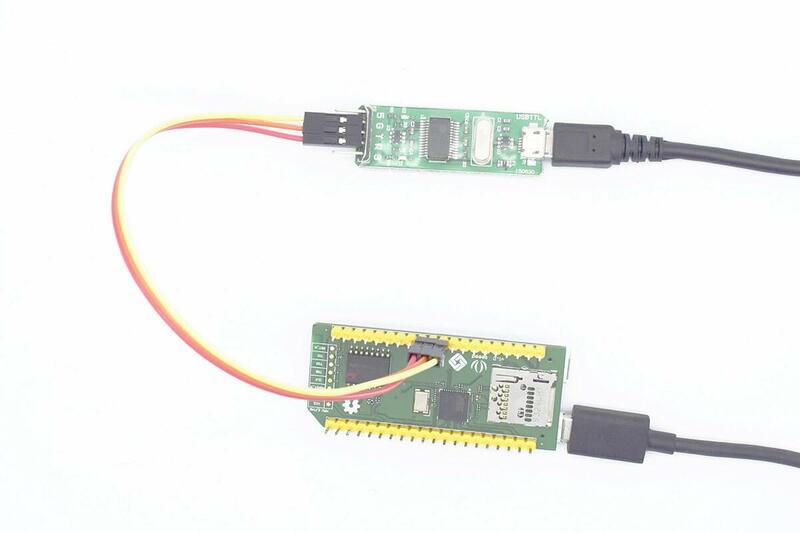 **Launch PuTTy and connect to system with USB to Serial adapter as shown in previous sections. Please note that there is 1 blank space after the first word "python", otherwise the example won't be found. **4. **After around 2 seconds, you will notice that the Wi-Fi LED blinks steadily. 5. **In the system console, type **CTRL + C, this will terminate the example. There are two kind of Wi-Fi modes: AP mode and Station mode. Refer here for the differences between them. **1. **Power up the board with a micro-USB cable. **2. 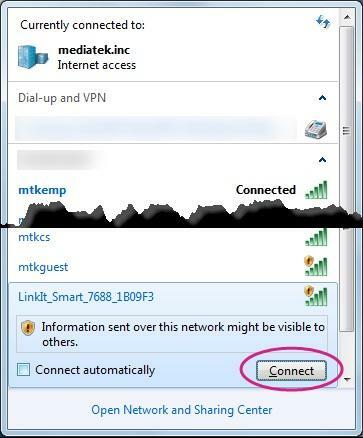 **Open the Wi-Fi connection utility on your computer and connect to the access point named LinkIt_Smart_7688_XXXXXX. XXXXXX is a kind of hardware identifier which varies from board to board. **3. **Open a browser with URL mylinkit.local/ or 192.168.100.1, set the password for root and sign in. Click Network on the upper right. **4. 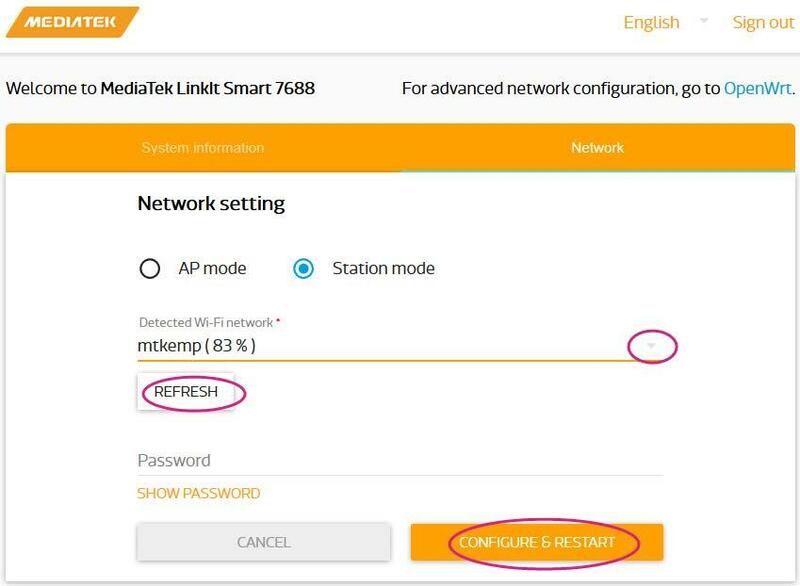 **Select the Station mode and click Refresh or downward arrow on the right to find the AP to connect to. After you have selected the AP, enter password if required. 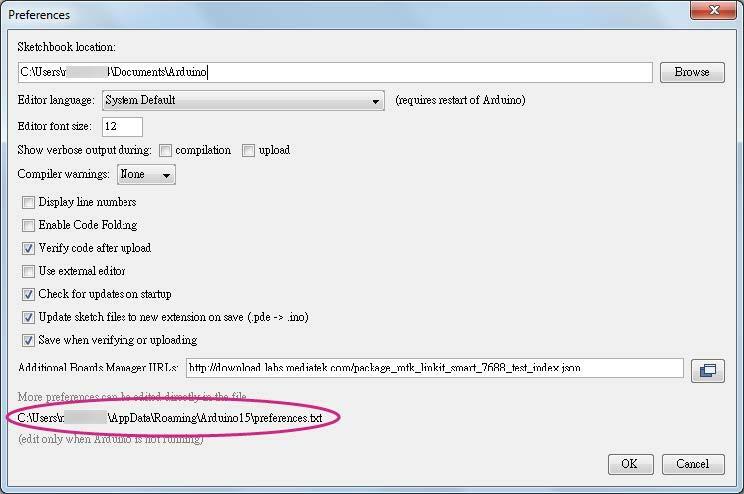 Click Configure & Restart to finish as shown below. Then wait for around 30 seconds to switch mode. **5. **Launch PuTTy and connect to the system with USB to Serial adapter as shown in the previous section. It will still enter the Station mode after rebooting the system. Press wi-fi button at least 5 seconds to switch back to AP mode. Note: It will be needed to reboot the embeded OS by using reboot command. **7. 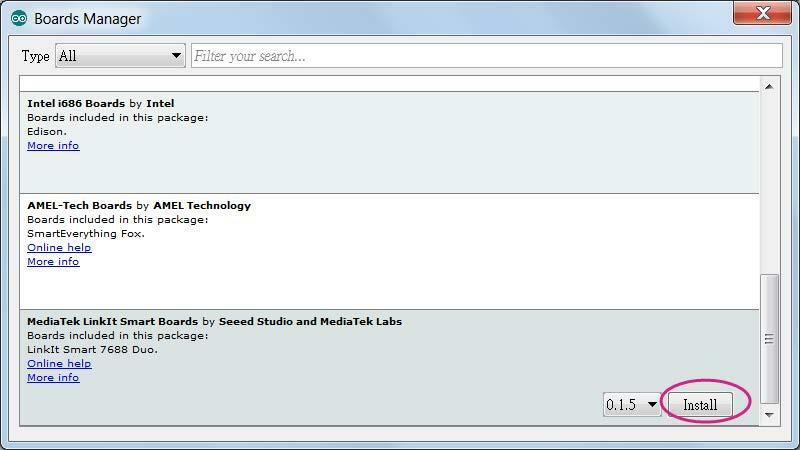 **Type the IP in a new Tab of browser and you can login to Web user interface to configure the system. **9. **Now you can use internet to configure your system on development board. This development board has features that are compatible with Arduino. So you can apply your Arduino code to 7688 platforms which makes prototyping process quicker. 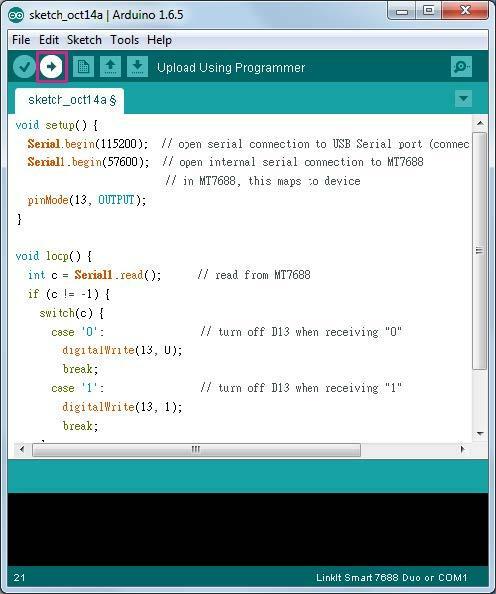 In this section, we will show you how to build an Arduino programming environment. 2. **Make sure your computer is connected to the internet. Download **LinkIt, decompress it and copy the files into the folder packages which gets same location with file Preferences.txt. Click following red rectangle marked section to open file location of Preferences.txt. 3. **In the Arduino **Tools menu point to Board. 4. 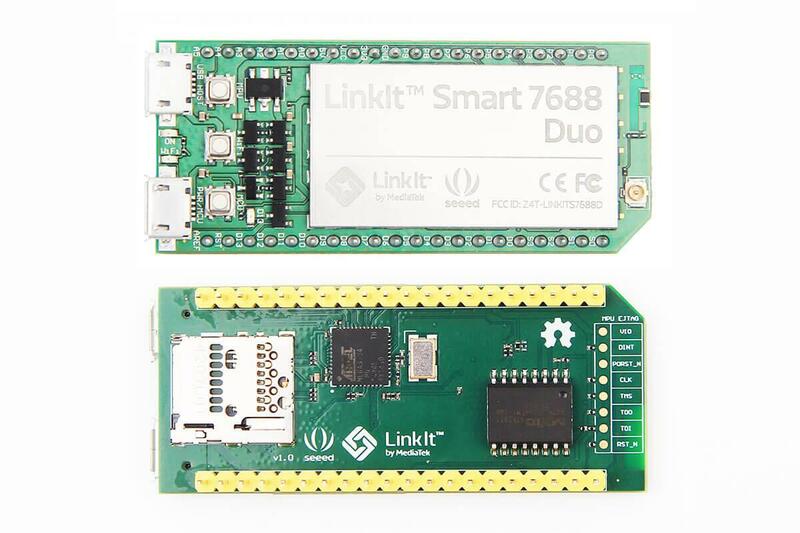 **There should now be a LinkIt Smart 7688 item appearing in the boards list on the Boards Manager and choose port with **COMxx (LinkIt Smart 7688 Duo). To avoid running out of memory during native application developments, you should setup the native application development environment in a more powerful host environment that enables you to cross-compile the executable format of the LinkIt Smart 7688 target instead. The following table shows an overview of the LinkIt Smart 7688 programming languages and the related development environments on host computer. 1. **Use FileZilla and refer to this tutorial, the server IP(replace **host name) address is the inet addr found in previous Switch to Station mode section, the username is root and password is password you set in that section. 2. **Open a text editor, copy and paste the below example code and save it as **helloworld.py. 3. **Copy the file **helloworld.py into system on target development environment (LinkIt Smart 7688) with FileZilla, place it under the folder root. **4. **Launch PuTTy and connect to system with USB to Serial adapter. 5. **Set working directory to /root and enter **python helloworld.py to execute. 6. **Now you can see **Hello World! printed in console. 2. **Then choose the correct COM port from the IDE (check your device manager) by clicking **Tools -> Port. **3. **Upload the sketch to the board. Note the board is not blinking yet - you will need to write a program in the Linux side to make it blink, which is the next step. **1. 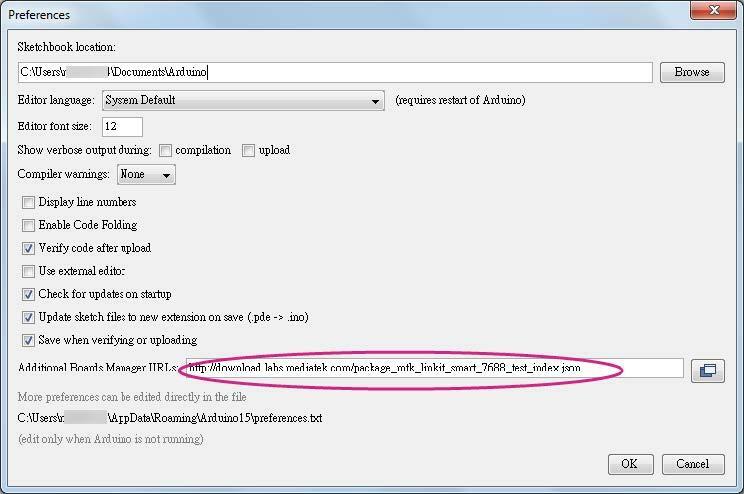 **Use a text editor of your choice and create a new file(a Python file), then copy the following code and save it. **2. **Execute this Python program in the system console - this program basically writes string of 1 and 0 to the /dev/ttyS0 port which maps to Serial1 interface in Arduino. The Arduino sketch that was uploaded in the previous section will receive the string and then blink the on-board LED accordingly. 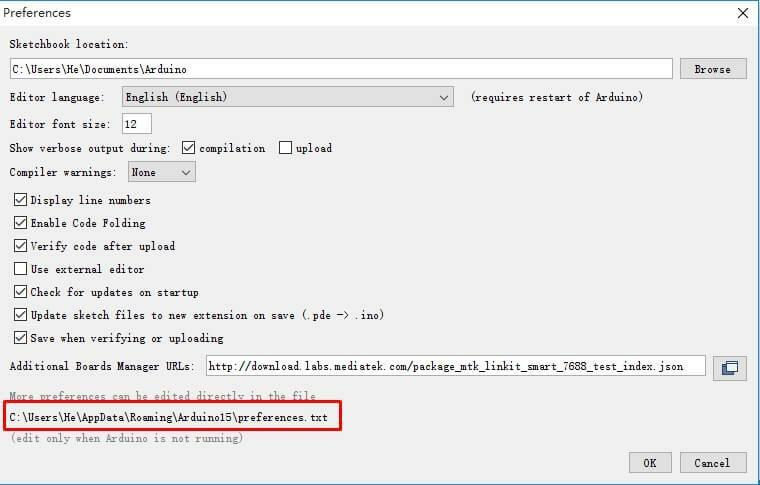 You can now extend the Arduino sketch to drive other devices such as PWM, I2C devices and synchronize the states by extending the command messages between Arduino and the Linux side. If more peripheral types need to be included, you can use some external libraries to implement the communication protocol. One such protocol - Firmata is described in the following section. Here is the FAQ from Mediatek. Alexa Based Smart Home Monitoring: You're at your Office and want to know about your home? Control your household devices and get alerts about home no matter wherever you are! DIY Smart Lamp - Controlled by Toggle Switch and Alexa: Build a smart lamp that can be controlled by flipping a switch and Alexa, for only $35. ReRouter - Make an Extensible IoT Router: Integrate a printer to my Router, so my grandpa or me can write things down at a web page and let the printer print it out. IOT Aquarium controller: An opensource 3D printed aquarium controller with IOT capabilities. 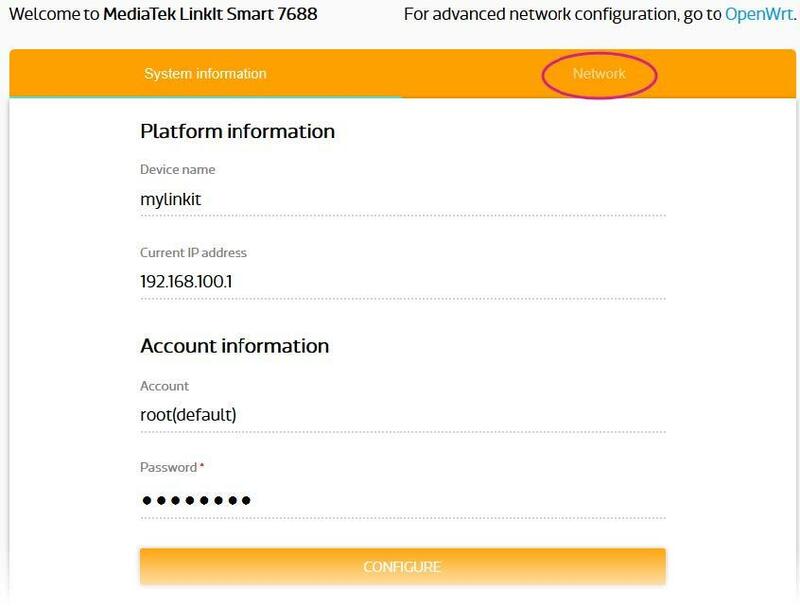 Smart Lighting and Notifications: Using a MediaTek LinkIt Smart 7688 Duo to wirelessly connect smart LEDs to your home automation system.